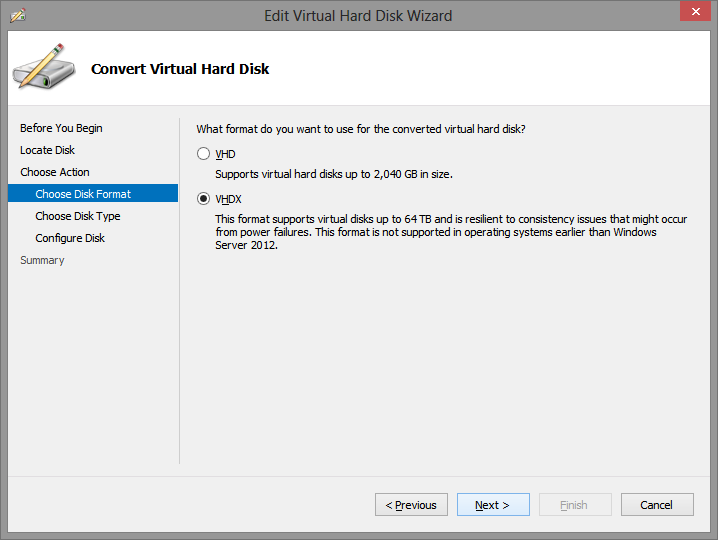 Windows Server 2012 Hyper-V offers a new virtual disk type called VHDX. VHDX virtual disks have many benefits, including larger maximum disks up to 64TB, protection against data corruption, and improved alignment of the virtual hard disk format to work well on large sector disks. See http://technet.microsoft.com/en-us/library/hh831446.aspx for more information about the VHDX disk type. You can convert existing older format VHD disks to the new VHDX format using the Hyper-V Manager console. 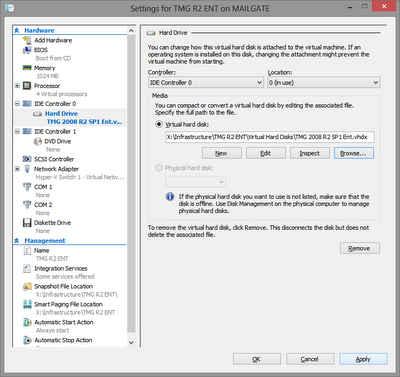 This process will create a new VHDX disk and copy the data from the existing VHD to the new disk. 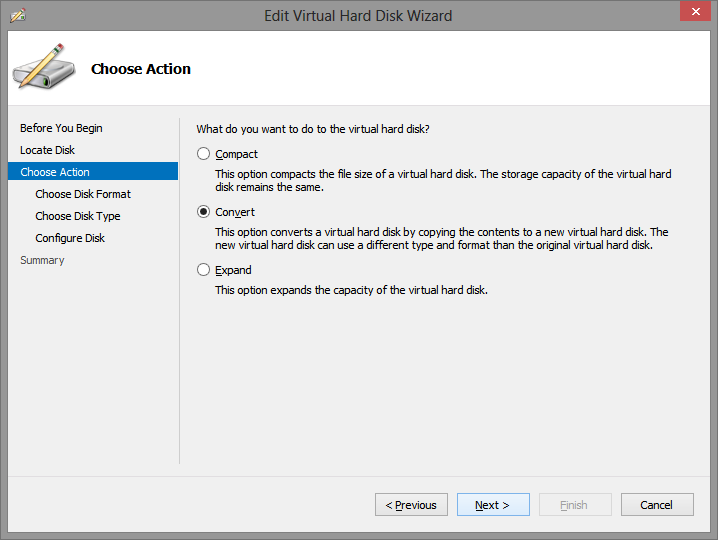 At the end of the procedure you will have two disks, the original VHD disk and a new VHDX disk with the same contents. You can safely delete the original VHD disk once you have confirmed that the new VHDX disk is fully functional. 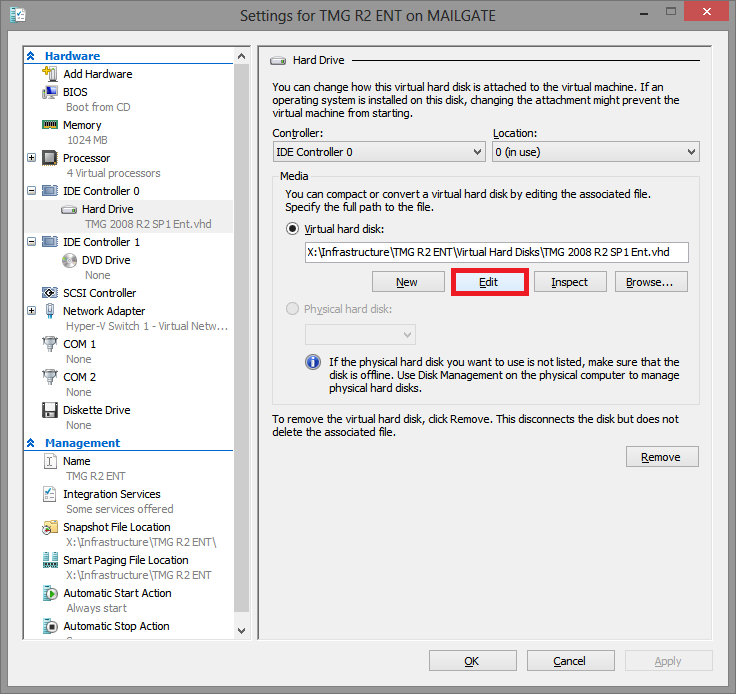 Shut down the VM that is accessing the disk, if necessary. You cannot convert a disk that is in use. The Edit Virtual Hard Disk Wizard will start. Select Convert from the Choose Action page and clickNext. Select the VHDX disk format and click Next. Choose whether the new disk should be fixed size or dynamically expanding. 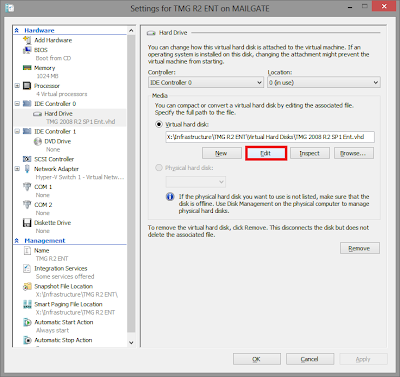 Note that this gives you the opportunity to change disk types from the previous disk type. Click Next. Select the name and location for the new VHDX disk and click Next. Review the summary and click Finish to create the new disk. This may take a few minutes depending on the size of the VHD and the speed of your hard drive(s). A 30GB VHD converted in less than two minutes on my SSD drive. The size of the new VHDX disk will be slightly larger than the original VHD disk. 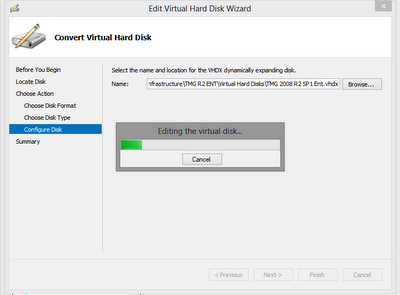 The last step is to mount the new VHDX disk to the Hyper-V VM. Note the new VHDX extension. Once you have started up your VM with the new VHDX disk you can safely delete the old VHD disk. There are no other configurations necessary. Did you find this information useful? Post a comment and share it with others!